Darwin found that earthworms have no sense of hearing – being indifferent to being shouted at and various musical instruments including a piano, a bassoon and a tin whistle. However, earthworms in pots placed upon a piano retreated into their burrows when notes were played indicating they are sensitive to vibrations transmitted through the soil. Darwin also investigated earthworm’s sense of smell by blowing tobacco smoke and perfume to which they did not react. They did however respond to the smell of their favourite foods. Darwin experimented with giving captive earthworms many different foods and noted which they preferred. He found wild cherry leaves were preferred over lime and hazel leaves. Cabbages, horseradish, carrot and celery were also liked but herbs such as sage, thyme and mint were barely touched. Much of Darwin’s book covers his work measuring the amount of earth brought to the surface by earthworms, both by measuring the quantity of casts (soil passed out of earthworms) produced and the rate that objects sink into the ground. Darwin’s initial observations included how cinders, lime and stones tended to be buried below the surface of fields over time. He also observed how great stones and ancient buildings are slowly buried - one of these stones can still be seen at Leith Hill and Darwin also made a trip to Stonehenge to observe buried stones there. 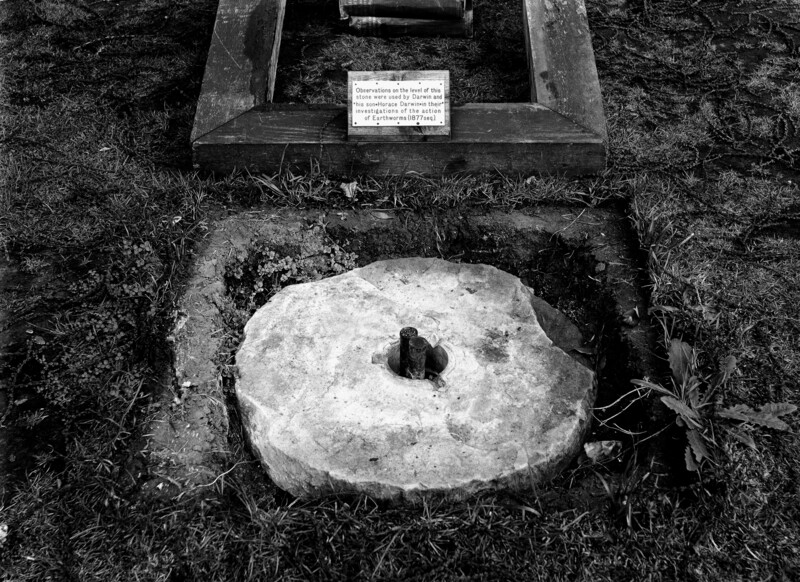 Darwin and his son Horace measured the rate of burial of a stone placed on the ground in his garden - the ‘worm stone’ still present at Down House was reconstructed by Horace’s Cambridge Instrument Company. Darwin estimated that earthworms move 15 tons of soil per acre to the surface each year - a process we now call bioturbation which is well demonstrated in this video. Deep-living (or anecic) earthworms create a deep vertical burrow which often has a midden consisting of stones, leaves, twigs and other items pulled into the entrance - perhaps as protection against predators, rain, cold or drought. Darwin found that earthworms do not select items randomly - he provided them with different types of leaves and observed how they were pulled down, finding that 80% of the leaves had been drawn in by the tip. Darwin then experimented further by providing the earthworms with triangles of paper - some broad and others narrow - and as with leaves the narrower end was dragged down first. The Formation of Vegetable Mould through the Action of Worms, with Observations on their Habits by Charles Darwin (1881) is available online at http://darwin-online.org.uk. Earthworm Watch has been developed by Earthwatch (Europe), and the Natural History Museum, London, in association with the Earthworm Society of Britain. If you haven’t had a chance to take part in Earthworm Watch please sign up, if you have completed the survey but have not sent in your results, please submit here.